As a congregation, we are committed to further the Gospel to the unsaved among us. We appreciate your prayers, encouragement, and support, as we together will see His Kingdom come on earth, as it is in heaven. On Thursday evening, Dec. 13, our congregation hosted our fourth outreach to the Israeli community in and surrounding Poriya Ilit. We incorporated the Feast of Dedication, Chanukah, into our celebration. The Brock Family, accomplished musicians from the USA, shared their gifts and talents with a splendid variety of tunes. Terri Morey, co-founder and wife of founding elder Eric Morey of the Poriya congregation, shares her memories and reflections about the evening. Dear Friends, For such a long time, Eric and I have had a burden to reach our people in Israel, especially the ones who live in our community….Poriya Ilit. So, we opened our home to celebrate various happenings, and last night we hosted a celebration of the Chanukah holiday….the sixth of the eight-day Festival of Lights. The Brock family, visiting from the USA, shared their musical gifts and talents. The father plays the guitar, while the mother and the four sons play the violin and other instruments. We invited our non-believing Israeli neighbors and we had Believers in our community invite their friends and neighbors. The six Chanukah candles were lit with the shamash (servant candle), followed by prayer to ask the Lord’s blessings on the evening. The Brock family is so wonderful, so poised and professional with the ways in which they play their violins and the guitar. The songs they shared so passionately and professionally in the first part of the evening were mostly from the classics. This part of the music was not familiar to all of us but the way in which each was presented was so enjoyable. What I especially loved was the sons - each of them had a solo. The mother had one as well. For the opening of the second part of their concert, they began the segment with “Oh Come, Oh Come Emmanuel.” It was incredible. 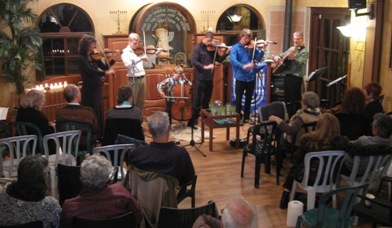 They then moved into, “Orange Blossom Special,” and “Come to The Mountain.” A medley of Israeli songs brought delight to everyone, especially the guests. Then some worship songs, without words, but the believers in the audience sang along. With each song the participation of the nearly 50 people became more obvious….the mood changed and people just wanted to get up and dance. One of our ladies did just that, at the tune of something that sounded very Irish. Also during the evening, we were inspired by a Chanukah message, about 20 minutes in length, given by one of our sabra Believers. He focused the message on the scripture, “Thy word is a lamp unto my feet a light upon my path.” Psalm 119:105. He beautifully drew each of us into the message of the light. He shared other Scriptures including, “I am the light of the world and he who walks with me does not walk in darkness.” Even though we know “Who” the speaker was quoting, the fact that it was Yeshua was not spoken but implied. To share something about Yeshua as Messiah with our unbelieving friends and neighbors in such a way was a first for us. In all of the other gatherings, we simply had music and food. This time we had all the elements of a service. The friends and neighbors we invited were thrilled with the evening. Everyone had a place to be last night - some served, some greeted, and some interacted with the attendees. Because of those who fulfilled their calling so unselfishly, the evening was highly successful. This morning, I had phone calls. One in particular was from one of the non-believing couples who attended. She said, “This was marvelous. The whole setting was good and what we heard was wonderful. Thank you for inviting us.” This same person asked when we could get together and talk. This is what we want! This is how we will share our faith! There are so many stories to tell but we pray you will get the whole picture what we are attempting to accomplish for the Kingdom through these outreaches and in other ways to show the Lord’s love. Do you know your neighbors? This is a good time of year to get to know them.